Epact: Astrolabe signed by 'ARN', late 16th century ? This geographical astrolabe has a projection, not of the celestial sphere, but of the geographical sphere from the North Pole to the tropic of Capricorn. The projection is the same in principle as that used in the ordinary astrolabe, but here applied to the earth to produce a map of the world. 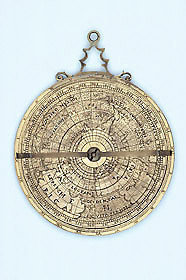 Astrolabes of this type can be used for finding the time and the length of the day in different parts of the world, but they usually have a simple form of rete, not present in this example. However, there are other problems with this instrument, such as mistakes in spellings and odd scale divisions, that make its authenticity doubtful.